AUSTIN, TX -- Texas Alliance for Life (TAL) announces that the state's newest specialty license plate, the Choose Life license plate, is finally on sale across the state. Proceeds from the sale of the plates will go to promote infant adoption as a compassionate alternative to abortion. TAL has been at the core of a coalition of pro-life, pro-family organizations that lobbied for 10 years in the Texas Legislature, which finally authorized the creation of the plates during most recent regular session. "We are thrilled to see the fruits of our labor finally realized with the availability of the Choose Life license plate in Texas," said Joe Pojman, Ph.D., Executive Director for Texas Alliance for Life. "Thanks to the support of the Legislature, Gov. Rick Perry, numerous pro-life organizations, and thousands of pro-life Texans, our state now has a specialty license plate with the message 'Choose Life.' Supporters across the state can promote the loving option of adoption wherever they drive." "Choose Life license plates send the message to Texans that there is hope for children in need of a loving home," said Texas Attorney General Greg Abbott. "I am grateful to the Legislature for authorizing the sale of Choose Life license plates to raise money for adoption awareness in Texas. And I am proud that the Office of the Attorney General has been entrusted with the responsibility to disburse those funds to organizations that will encourage adoption as an alternative to abortion." During the 82nd Regular Session, the Legislature overwhelmingly passed Senate Bill 257, authored by State Senator John Carona (R-Dallas) and sponsored by State Representative Larry Phillips (R-Sherman), to allow the Texas Department of Motor Vehicles (TxDMV) to create the plate. On May 17, Gov. Rick Perry signed the bill into law. During the special legislative session in June, State Rep. Geanie Morrison (R-Victoria) successfully authored an amendment to House Bill 2 to ensure that all of the proceeds are available for adoption by fixing a budget provision that would have held 50 percent of the proceeds from all specialty license plates sold during the biennium. 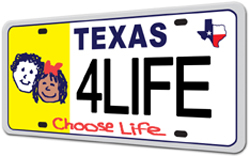 Texas is the 25th state with a Choose Life plate, and more than $15 million has been raised to promote adoption in the 24 states that currently have the plate available, according to Choose Life America, Inc.
TAL has long been interested in bringing the license plate to Texas to promote a culture that is more open to adoption. "Few people realize that fewer than one percent of children born in nonmarital circumstances in Texas are placed for adoption, and for every child placed for adoption 60 children die from abortion," Pojman said. "Our goal is to make people more comfortable with adoption and to promote a culture of life that saves babies whether they are parented or placed for adoption." As the official state sponsor organization for the Choose Life plate, TAL paid to the TxDMV the initial $8,000 administration costs, which will be reimbursed after 800 sets are sold. The Choose Life license plate can be ordered online and at each county vehicle registration site for cars, light trucks, motorcycles, and mopeds. For more information, visit www.TexasAllianceforLife.org.